Stratigraphic interpretation is a key approach to helping seismic interpreters understand depositional environments, reservoir facies distribution and fluid migration pathways. 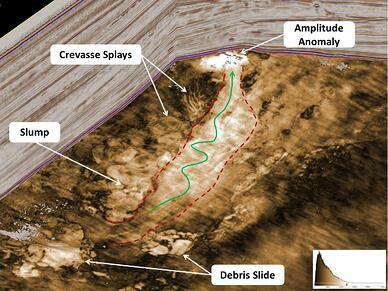 3D seismic data are a key source of information in stratigraphic plays. Interpreters are the primary investigators of these data and are tasked with extracting geologically meaningful information from seismic data volumes covering hundreds to thousands of square kilometers. 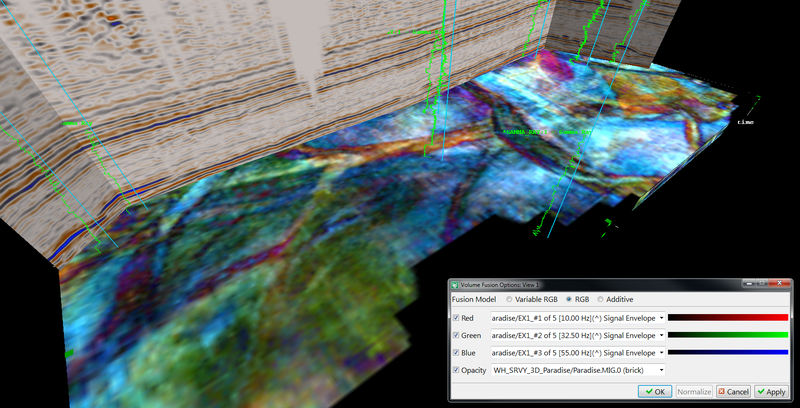 Caption: Multiple spectrally decomposed seismic data volumes are co-rendered using RGB Volume Fusion. This display enhances the visibility of cross-cutting fluvial stratigraphic features and bedding thickness variations within the Mannville Group, Western Canadian Sedimentary Basin. Yet, trying to identify prospective locations in a 3D seismic volume can present a challenge. Consider that a moderately sized 3D survey contains upwards of 150 billion data samples. How does an interpreter locate the few thousand samples that contain information pertaining to a hydrocarbon reservoir? Hunting for less than 0.0001% of the samples in a seismic volume can amount to searching for a needle in a very big haystack. Typically the “interesting” geology lies hidden in weak, discontinuous seismic reflections. When viewed in a vertical cross section, the subtle meaning of amplitudes can easily be overlooked. When viewed along a stratigraphic slice, however, the lateral variation in amplitude patterns can be enlightening. Lateral facies variations, erosional processes and sediment remobilization features all can be readily extracted from these easily overlooked seismic events. Caption: A stratigraphic slice through a deepwater depositional system revealing slump features, debris slides, and interpreted fluid migration fairway leading up-dip (green arrow) to a high amplitude anomaly associated with a structural high (potential direct hydrocarbon indicator). Data courtesy of AWE Limited. The release of Paradigm 2011.3 introduced new interpretation and modeling functionalities that strengthen workflows for stratigraphic prospecting. This includes extended capabilities from the SeisEarth interpretation system within the same visualization canvas used for multi-survey regional interpretation. Plus, new workflows enable geoscientists to perform single-horizon and multi-horizon volume flattening (i.e. vertical shifting) and horizon-parallel and multi-horizon proportional slicing through seismic data volumes. In conjunction with the 3D Propagator horizon tracker, interpreters can interactively slice seismic data volumes along interpolated stratigraphic layers with subsample precision while maintaining a regional perspective of the complete depositional system. Working in a Paleo-Chronostratigraphic workflow, the seismic interpreter and geologist can use the structural model to accurately flatten the seismic information to the original time of deposition. The seismic image can be “rebuilt” from the structural and stratigraphic interpretation, at the time of deposition for all seismic events at once, making faults disappear. The geoscientist can interpret a true-paleo flattened seismic volume, roam through seismic data using opacity, detect prospective geobodies and restitute them onto-the present-day space. Complementary to surface-based stratigraphic analysis, the voxel rendering technology developed in VoxelGeo is embedded into the 3D canvas. This visualization process removes artifacts to reveal details of the geology and accelerate refresh speed through the use of GPUs where hundreds of cores are deployed for seismic volume rendering. By deploying this technology in the same application used for multi-survey interpretation, interpreters can carry out detailed volume rendering of stratigraphic features without the need to move from one application to another. Note: This article was originally published DEW Journal and E&P Daily News at the 2013 EAGE Conference & Exhibition. Want to discover the value of an integrated G&G interpretation system? Wes Hamlyn is the Product Manager for Paradigm’s seismic interpretation and modeling solutions. After completing a B.Sc. (Hons) in Earth Sciences from Memorial University, Canada, he joined Paradigm as a geoscientist in 2003. Wes has worked in Paradigm’s Calgary and Kuala Lumpur offices and has engaged with clients throughout North America and Asia Pacific advising on best-practices for interpretation and reservoir characterization using Paradigm technologies.